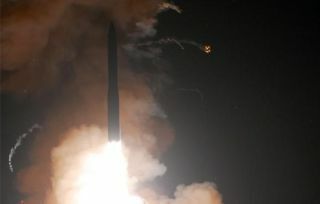 A Minuteman III intercontinental ballistic missile launches on June 16, 2010, from Vandenberg Air Force Base, Calif.
Modern armies rely on a wide range of electronics to help detect their enemies, coordinate their forces and aim their weapons. Today, knocking out those electronics requires sophisticated jamming aircraft, targeting the people using the electronics or the tech-frying side effects of a nuclear blast. But in the future, disabling enemy electronics may only take a single rocket totally harmless to humans, thanks to a new microwave missile developed by the U.S. Air Force. The missile showed its ability to take aim at many targets and locations during a first flight test at the Utah Test and Training Range at Hill Air Force Base earlier this year. Upcoming tests could demonstrate its disabling power with high-power microwaves capable of burning out the electronics of even the most sophisticated air defenses, command and control centers, fighter jets and drones. That first test of the Counter-electronics High-powered Microwave Advanced Missile Project (CHAMP) was recently unveiled by Boeing and the U.S. Air Force Research Laboratory. The three-year, $38 million program could deploy up to five prototype missiles, according to the Air Force solicitation issued in December 2008. A fully functional missile would have the capability to take out multiple targets and take multiple shots with high-power microwaves by itself. Such missiles may not necessarily help U.S. forces in the ongoing fight against insurgent forces in Afghanistan. But they could prove more useful in scenarios resembling the recent Libya bombing campaign, where NATO planes and missiles assaulted the forces of former dictator MoammarGadhafi while trying to minimize civilian casualties. The missiles might even help knock out swarms of enemy drones or manned aircraft before they ever get off the ground. It's unclear if they could also target such aircraft in flight.